When he was 16 years old, Connor Bleakley asked his father, David, if he could have his foot amputated. David thought it was probably a good idea. By that point, Connor had lived with severe pain in his foot and ankle for years. He had gone through numerous treatments to relieve the discomfort, with little effect. A sophomore in high school, Connor was unable to walk without crutches due to intense pain. So when, in desperation, Connor asked to have his foot taken off, David didn't see any other choices. After their medical insurance company denied the request for amputation surgery, though, a doctor in their home state of Colorado suggested they see Tracy Harrison, M.D., a specialist in pain management at Mayo Clinic in Rochester, Minnesota. Dr. Harrison connected them with the Pediatric Pain Rehabilitation Program. The program couldn't get rid of Connor's pain, but it could help him move beyond it. "At first, I was a little skeptical. I'm an engineer by trade. My mindset is 'let's fix it.' I was looking for a procedure, a surgery, a pill, something to get it done," David says. "This was different. The program is geared toward recognizing the fact that these kids have chronic pain, but they can function despite that. It was a big switch in our thinking, and it was absolutely life-changing." Connor has had difficulties with his left foot all of his life. When he was born, the heel appeared puffy and large. As a toddler, he wouldn't put weight on that heel and walked up on his toes instead. At age 7, Connor developed pain below his ankle on the inside of his left foot. Possible remedies, such as shoe inserts, did no good. The pain kept getting worse. No one could figure out why. Over the next 10 years, Connor went through a multitude of diagnostic tests and tried almost every possible treatment option to relieve the pain. The tests revealed no clear diagnosis. A wide range of medications, physical therapy and several surgeries had almost no impact. By 2015, Connor was so frustrated and in so much constant pain, he was ready to be done with his foot completely and go through with an amputation. When that fell through, too, the family was at a loss. "At that point, we were stuck," David says. "One of our doctors had been at Mayo Clinic previously. She knew of Dr. Harrison and thought we should consider seeing her at Mayo. We didn't know where else to go, so we made the appointment." When Connor and David came to Mayo Clinic in August 2015, they met with physicians from a variety of specialties. Dr. Harrison was the last one on their schedule. After reviewing Connor's extensive medical history, she recommended the Pain Rehabilitation Program. "She was really the only one who could offer anything concrete," David says. "No one else knew what to do for Connor. So we agreed on pain rehab." The father and son returned to Rochester to start the three-week program at the end of September. Connor was enthusiastic from the start. "Connor was very open to it. He's on the autism spectrum, and he tends to be very black-and-white in his thinking," David says. "He latched right on to the directions the staff gave him about how to deal with the situation. From day one, Connor was very focused on what they told him to do." It took David a little longer to come around. At the pair's first Mayo Clinic visit, a neurosurgeon who David was interested in talking with wasn't available. So they made arrangements to see him when they returned. "Honestly, I wasn't sure about the pain program initially, but I really wanted to talk with that surgeon," he says. "When we did meet with him, he said there was nothing that had been missed and nothing they could do surgically. He encouraged us to continue the Pain Rehabilitation Program. From then on, we were all in with pain rehab." As they worked through the program, Connor and David came to realize it offered something completely different from the way they dealt with the pain before. It provided education, so they could more fully understand chronic pain. It also offered tools to help the family take their focus off pain and turn their attention to the daily tasks Connor needed to do. "They stressed function. Even if you're hurting, you have to go to school. You have to do your chores. You have to participate in life," David says. "Connor wasn't doing that before we came to Mayo Clinic. The program was a good kick-start for him to realize that it was okay to use his foot, even though it was painful. The pain didn't mean he was injuring himself or damaging his foot. He could keep going, and he has." Since finishing the Pediatric Pain Rehabilitation Program, Connor has been able to return to school. He walks dogs several times a week and has taken a job at a restaurant where he stands on his feet for several hours a day. 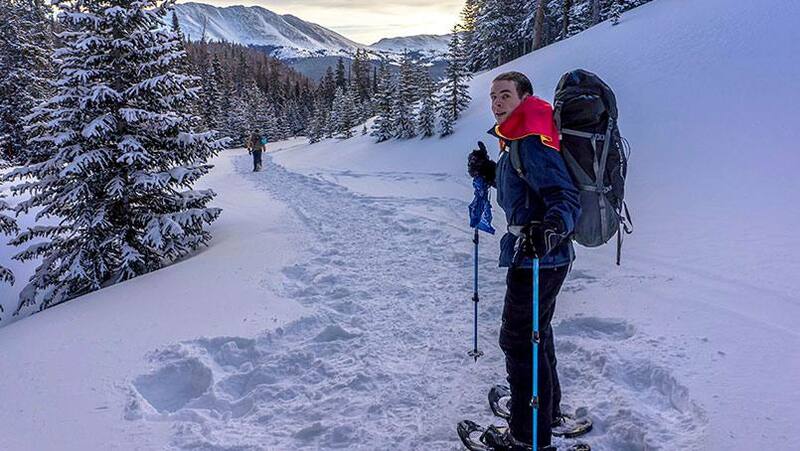 In January, he participated with his class in a hiking and snowshoeing trip in the mountains that covered four miles and spanned 1,000 vertical feet. "To see him now versus where he was a year ago is like night and day," David says. "I can't stress enough how dark things were for us in the spring of 2015. Connor was in constant pain. He couldn't sleep at night. He had been on crutches for more than a year. When he put his foot down, it was painful. We didn't know why it was hurting so bad. We were at our wit's end. Now it's completely turned around." Connor still takes a non-opioid pain medication daily. His dose, however, is dramatically lower than it used to be. His goal is to eventually wean himself off it completely. As he has become more active, his foot and ankle have gotten stronger. Now Connor is able to join in activities that weren't possible for him before. "We go hiking together. He can play outdoors barefoot. He walks with the dogs about eight miles a week," David says. "The pain program at Mayo Clinic gave him the confidence to do that, to get him moving. There are days he still hurts. But in general, he's functioning at a very high level. This has been a tremendous change."